Galaxies consist of many stars. For instance, our own Milky Way galaxy is estimated to contain roughly 250 billion stars. Despite this very large number, galaxies appear to consist largely of empty space. However, that appearance is deceiving. There exists a very tenuous mix of gas and dust between the stars that is generally referred to as the interstellar medium (ISM). The density of this material is extremely low: between 1 particle per cm3 in the general ISM and 10,000 to 1,000,000 particles per cm3 in “dense” regions. Such numbers are hard to comprehend. In most of the ISM, the density is lower than the hardest vacuum that can be created in laboratories on Earth. Nevertheless the ISM can be observed. This is only possible because there are vast regions of space filled with the ISM, leading to a significant cumulative effect. This enables us to study the ISM, which is important for several reasons. These will be discussed a bit later. Fig. 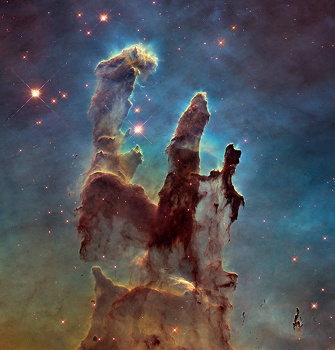 1 – "The pillars of creation". 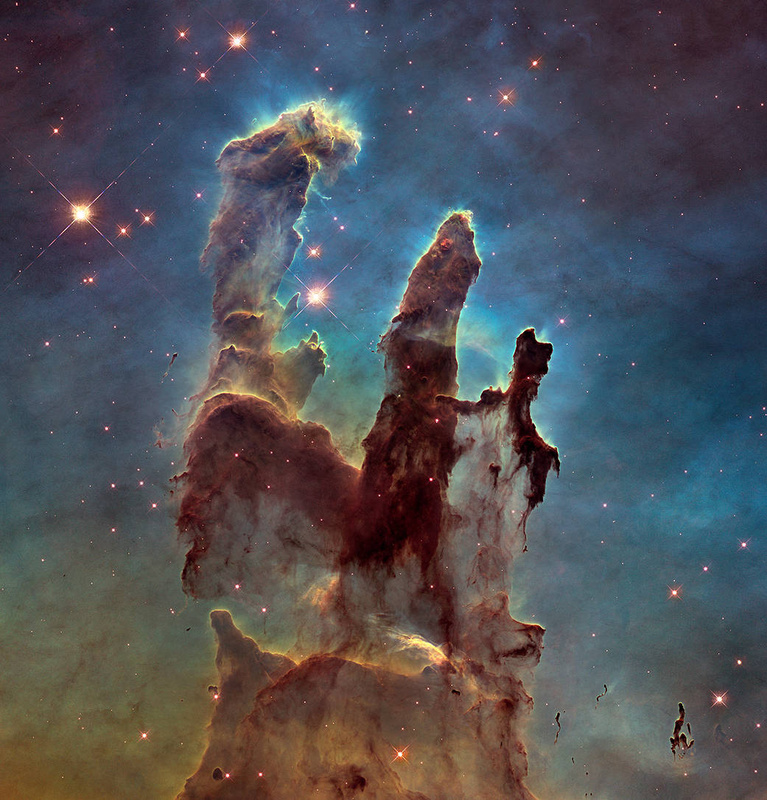 This is a star forming region in the Eagle Nebula. In the dark regions new stars are being formed, but the nebula is also being eroded by the ultraviolet light from nearby stars that were recently formed in the nebula and have now evaporated the part of the cloud that was immediately surrounding them. Image credit: NASA. The ISM is a mix of primordial and processed material. The primordial material was created in the big bang and consists almost exclusively out of hydrogen and helium. This is the material the galaxy was formed out of. This gas then collapsed further into the first generation of stars. All stars produce energy through nuclear reactions, e.g. by creating helium out of hydrogen. But during the final stages of their evolution also other nuclear reactions take place, such as burning helium into carbon and oxygen and possibly even heavier elements. These nuclear reaction products are then mixed to the surface of the star by convection and eventually expelled into the ISM either by a wind emanating from the stellar surface or by an explosion (such as a supernova). This is the processed material that is continually being added to the ISM by the stars. In this mix of primordial and processed material dense regions will form, called molecular clouds, where new stars can be formed. So this second generation of stars will not only contain hydrogen and helium, but also heavier elements that were created by the first generation of stars. This way we have a cyclic process where stars are formed out of the ISM, create heavier elements (such as carbon and oxygen) in their interiors, expel that material back into the ISM where it can be used to form new stars. With each turn of this cycle, more and more heavy elements are formed. This cycle is a necessity to create rocky planets and eventually life. Fig. 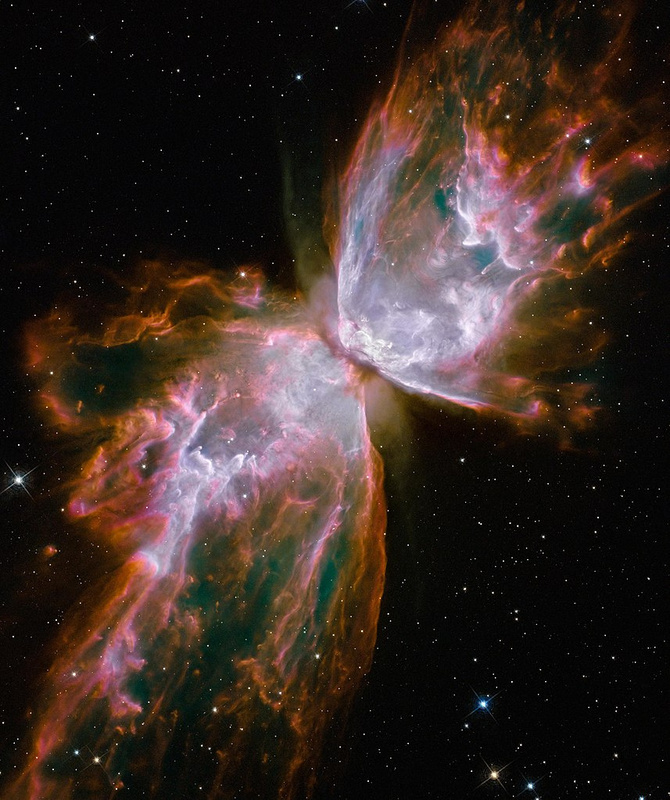 2 – NGC 6302, also called the Bug Nebula, is a beautiful example of a bipolar nebula. It's a young planetary nebula with a massive central star (a white dwarf) which is one of the hottest stars in the galaxy. It has a surface temperature in excess of 250,000 degrees Celsius. Image credit: NASA. From this description it is clear that the ISM plays an important role in the evolution of a galaxy as it creates the molecular clouds in which new stars and planetary systems are formed. An example of such a cloud is shown in Fig. 1. Molecular clouds are also important for other reasons. Since they are dense, they shield the inner regions from the ultraviolet light emitted by other stars. This allows chemical reactions to take place, and in particular allows ice mantles to grow on dust particles. These ice mantles are well-suited to allow complex organic molecules (including pre-biotic molecules) to form. Hence molecular clouds may also play a role in the creation of life in that manner. Given their importance, molecular clouds and star forming regions are widely studied. Stars that are close to the end of their life eject a lot of gas and dust into the ISM. This forms a circumstellar shell around the central star. As the central star evolves and heats up, it will ionize the gas in the circumstellar shell allowing it to shine in beautiful colors. An example is shown in Fig. 2, which is a false-color composite of optical images of the Bug nebula. Such evolved objects are ideal laboratories for studying fundamental processes as the material in the circumstellar shell exclusively comes from a single star, making the interpretation of observations easier. They can (amongst other things) be used to test evolutionary models and study mass loss processes, dust formation, molecular chemistry and nuclear reactions (as the gas is enriched with the products of nuclear reactions that happened in the interior of the star). All these types of research are conducted at the Royal Observatory by a group consisting of Martin Groenewegen (studying asymptotic giant branch (AGB) stars), Griet Van de Steene, and Peter van Hoof (studying post-AGB stars and planetary nebulae). In order to interpret observations of the ISM, researchers need a modeling code that allows them to derive physical quantities such as temperature and density of the gas, the chemical composition, and the degree of ionization, as well as properties of the source of light (often a star). For this the photoionization code Cloudy is available at https://nublado.org/. This is an open-source code that can be downloaded free of charge. The aim of the code is to model the ISM in the widest possible sense with emphasis on the detailed treatment of physical processes. As the name indicates, it can handle regions that are ionized by photons. But it can do more than that. It can also model regions that are heated solely by collisions as well as neutral and molecular regions. To our knowledge it is the only code that can treat all these processes in a self-consistent manner. The code is widely used and currently more than 300 scientific papers each year cite the Cloudy code. It has been named as one of the “power-horses” in the section “public software for theory” by ASTRONET in its 2008 report. A code like Cloudy needs continuous development to update the physics and include new fundamental data. This development is done by an international team which includes Peter van Hoof from the Royal Observatory.